You know about Dollywood, right? The homage to Dolly Parton in the Great Smoky Mountains of Tennessee? Now there's a veritable Harleywood, a Harley-Davidson-themed mall near Daytona Beach, Florida. 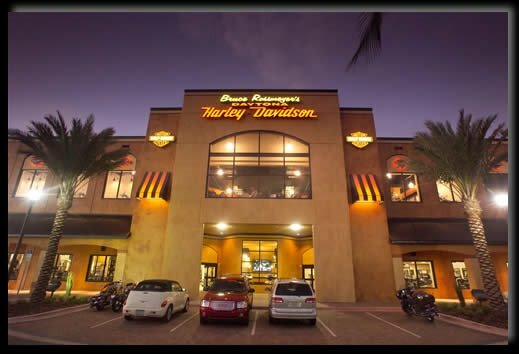 It's where all the Hecks Angels go to blow a few bucks on genuine Harley-Davidson swag. To buy denim jackets for their dachshunds. "Once it was about the ride; now it's about the destination" brags the Web site. Got that? Motorcycling is not about riding any more: it's about accessorizing. You can even live at Destination Daytona, safely ensconced in your upscale condo, tuned to American Chopper on The Discovery Channel, watching the Orange County Choppers crew -- the adorable Senior, Paulie, and Mikey -- in another outrageous and goofy, yet wholly artificial, race against time as they send out another Harley to some other shop for customization. The biker lifestyle brought to your high-definition plasma screen: it's almost like they're shouting obscenities at each other in your livingroom. Is that motor oil on the Persian rug? Imagine an update to the 1966 Roger Corman flick, The Wild Angels: "We want to be free. Free to ride our machines and not get hassled by the Man. And we want to be able to go shopping too." Peter Fonda'd be an accountant and HOG member, clad head-to-toe in Genuine Harley-Davidson (TM) apparel; his old lady, played by Nancy Sinatra, would ride an Arlen Ness pink Sportster and be a shoo-in for partner at Wilson Sonsini Goodrich & Rosati. Michael J. Pollard's customary off-the-wall sidekick character would write free software and do a little consulting on the side, just to pay for his bitchin' ride. It costs a lot to be an outlaw these days.